Scientists have discovered a new family of caecilians, the most enigmatic branch of the amphibians, in northeastern India. Caecilians, which at first glance resemble worms, live in forest soil and are most closely related to an African group of caecilians. The females incubate their young for several months without eating. Writing in the Royal Society Journal Proceedings B, the scientists say the animals may be threatened by population growth and slash-and-burn agriculture. Caecilians are very hard to spot as they live either underground or under leaf litter that lies on the soil. The new discovery was the result of about 250 soil-digging expeditions over five years that covered every northeast Indian state. “Caecilians are the most cryptic group of animals, and it’s not possible to identify whether it’s a new species or genus or family just after collecting it,” said SD Biju from the University of Delhi, who led the project. “We studied the molecules (DNA) and the morphology, both internal and external, to identify the species,” he said. When the analysis was complete, the researchers found they had not only a new species on their hands, but the first representative of a hitherto unknown family. This is the 10th caecilian family to be identified, and the team named it Chikilidae, derived from the name used in the local Garo tongue. DNA evidence suggests the family split from its closest African relatives more than 140 million years ago, when the ancient super-continent of Gondwana fragmented, separating present-day India and Africa. Unlike the familiar frogs and salamanders, caecilians are limbless and smooth. Their eyesight is very limited and their skulls adapted for burrowing. Reproduction and rearing of the young are varied. 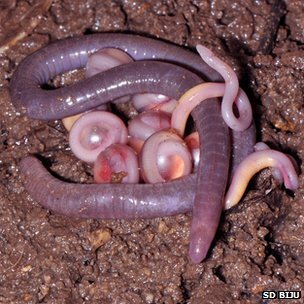 The most unusual known example is a species where the babies eat the mother’s skin, which she sheds for the purpose. Chikilidae’s habits are not quite so spectacular, though the mothers stay wrapped around their developing eggs for 2-3 months at a time, apparently not eating at all during this period. Although Chikilidae turned up in about a quarter of the survey sites and so might be quite abundant, Prof. SD Biju believes its future is not assured. “We found them not only in the forest area but also very close to human settlement,” he said. Some of the animals have reportedly been killed by villagers who mistook them for poisonous snakes. In fact, they carry no venom. One positive point for the new discoveries is that the region seems to be free of the fungal disease chytridiomycosis, which has devastated amphibian populations in many parts of the world. Globally, amphibians are the most threatened group of animals, with about 40% of species on the internationally-recognized Red List. But new discoveries are regularly made, though most come from rarely-visited regions of rainforest rather than quite densely-populated areas. Prof. SD Biju has been involved in discovering scores of other new amphibian species in India, where he has been dubbed “FrogMan”.